While doing some research for wedding décor, we found some great ways to save money on everything from your wedding dress to your centerpieces. Here are a few online stores and stores we visited in Lubbock that were helpful and had great deals. Wedding recycle is a great website to buy and sell wedding items. They have everything from bridal accessories, bridal party accessories, jewelry, candles and candleholders, to cake and dessert bars, and centerpieces. They even have wedding dresses and tuxes. 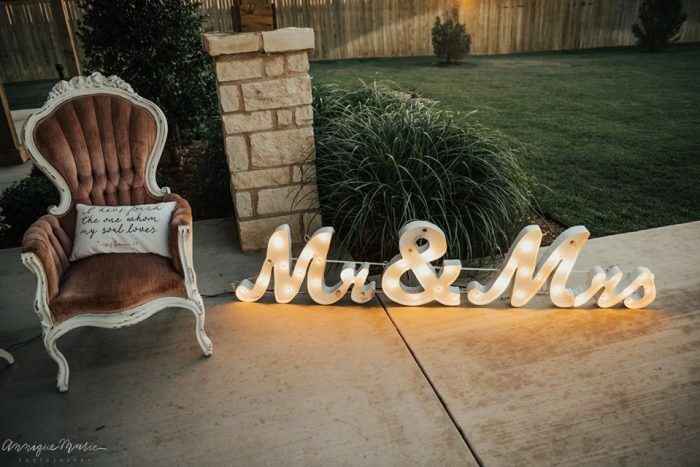 They have a great selection of ceremony and reception décor including lanterns and signs. Tradesy is another great website to buy and sell used wedding décor and gowns. They have a wide variety of table clothes and other ceremony and reception décor. Bravo Bride is a free website for new and preowned wedding items. If you are looking for a preowned wedding dress this is the place to go! They have gorgeous wedding gowns that have only been worn once! Wayfair is one of my absolute favorite online shops. They have anything and everything! More importantly- they are almost always running a sale! If you would rather look in person or need something immediately and don’t have time to shop online, we visited a couple of retail stores in Lubbock that had great choices at reasonable prices. If you are looking for new stuff Hobby Lobby always has great options. You can always find things 50% off. If you see something you want but its not on sale, wait until the next week and it will more than likely be 50% off. If you can’t wait you can always pull up their 40% off coupon on your phone. You can find the coupon here! We’ve recently seen a lot of great things at Kirklands that could be used as wedding decorations. You can usually catch things on sale here too if you are patient. They recently had all lanterns 20% off! If you sign up for emails online, you automatically receive a 20% off coupon! Autumn Oaks has recently added a small inventory of wedding decorations as an additional option! We are excited to add something extra for our Brides!